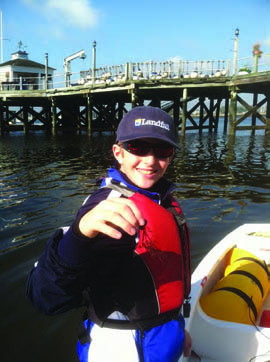 Editor’s note: On Saturday, October 20, 12-year-old Justin Smith of Muttontown, NY sailed his Optimist from Stamford, CT to Oyster Bay, NY. 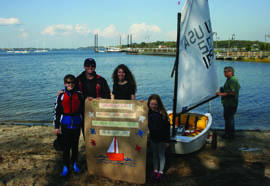 Justin, a member of Seawanhaka Corinthian Junior Yacht Club (and the subject of our October On Watch article), embarked on his journey to raise funds for a bioextraction project to help restore the Long Island Sound ecosystem. I started my day early in the morning with a good breakfast. Most of the preparation for my solo sail across the Long Island Sound in my eight-foot Optimist (“Opti”) had already been completed the evening before. After loading my Opti on the car with my father, my mother drove me to Stamford Yacht Club in Stamford, CT, where I would begin my adventure. My dad went to meet my coach, Ben Benfield, at The WaterFront Center in Oyster Bay to prepare to travel across the Sound by boat to meet me in Stamford. While I was rigging my boat in Stamford, Professor Charles Yarish of the University of Connecticut (who is leading the bioextraction project I am raising money for) arrived to see me off. I set sail from the beach at around 10:30 a.m. into the still waters of Stamford Harbor. My dad and Ben followed me in the chase boat. I didn’t expect it, but it took about an hour to get out of the harbor. The wind was blowing from the south, so I was forced to sail upwind and do a lot of tacking. In addition, there were a lot of boats anchored in the harbor, followed by breakwaters that really narrowed my path. I was beginning to think this was going to be a looooong trip. When I finally got out of Stamford, the winds had shifted to the southwest so I was able to sail on a reach through most of the Sound. The waves were not too big and the winds were constant at around 10-12 knots, making for a very nice journey across the open waters. I didn’t feel very tired at the time, but as I look back on the event it was very exhausting. It was a very long distance – much farther than I expected. I was surprised to find that I was one of the only boats on the water – I only saw two other, much larger, yachts during my entire crossing. When I finally crossed over into the mouth of Oyster Bay, between Centre Island and Lloyd Neck, the wind almost completely died out. What wind was left was hard to navigate because it shifted back to south. There were many boats anchored as I passed through the bay, the wind was extremely shifty and it was very hard to tell where it was coming from. 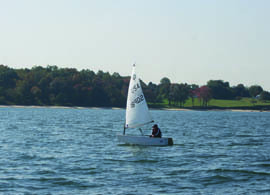 While passing through Oyster Bay I saw a few Opti sailors sailing near the coast! It was a long distance through Oyster Bay – much, much further than sailing through Stamford Harbor, but I already expected that. I arrived safely on the beach next to The WaterFront Center almost exactly four hours after leaving Stamford. 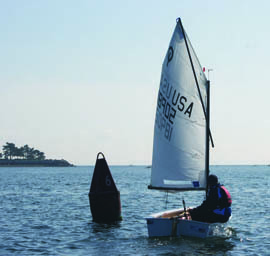 When I was passing the fishing dock on the way to the beach, I was excited to be greeted by lots of people screaming, “Go Justin!” and “Yay Justin!” I also saw a great poster that my sister Samantha made with my grandmother welcoming me back to New York and congratulating me on my sail! My journey across the Sound was really great and the best part is that it was for a really important cause. The bio extraction project I am funding is very important to me. Although I thought that the distance from Stamford Yacht Club to where I landed in Oyster Bay was going to be approximately eight miles, I didn’t realize how far I had actually sailed until I looked at the tracking app on my phone – just over 14 miles! Thank you again to everyone who supported me: my parents, family, friends, donors, all of you who have been following me on my Facebook page (Justin Protects the LI Sound), and of course The WaterFront Center, Stamford Yacht Club, US Sailing, Landfall, Magic Marine, Sperry Top-Sider, WindCheck, my coaches and everyone else who has helped me along the way. The money I raise will be used, in partnership with the National Fish and Wildlife Foundation, to support a bio-extraction project in New York’s Bronx River, which flows into Long Island Sound. In this project, oysters, ribbed mussels and seaweed will be placed into the river to filter the water naturally, remove waste particles and add more oxygen to the water. I will be continuing my efforts to raise money and awareness for this important cause through January 2013. Please support this important cause and mail your check, payable to the National Fish and Wildlife Foundation, to Justin Smith, P.O. Box 176, Locust Valley, NY 11560 or call my dad, Brian Smith, at 516-650-0838 for more information. I’m already planning another solo sail across the Sound again next fall, and I hope other experienced Opti sailors will join me. In fact, some of my friends from Seawanhaka and The WaterFront Center have already signed on! A group of Optis sailing across the Sound together will be really great and will surely make for a fun and challenging event! If you’re interested, please check out my Facebook page.